Great moments are born from great opportunities. 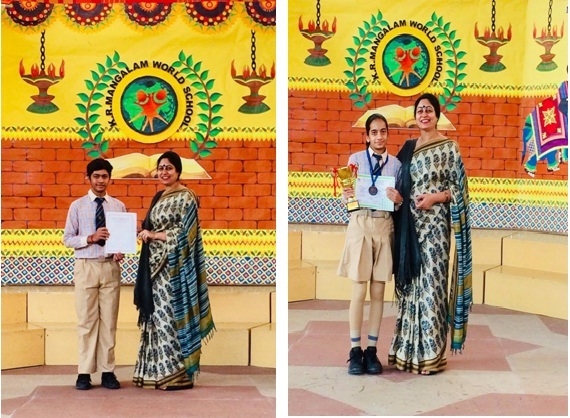 Alicia Jatyan of Class 7B and Kunal Chhabra of Class 9B carved a niche for themselves in the sports arena and has proved that winning is believingin ‘Yes, I can’. Alicia had taken part in the CBSE Central Zone Judo Championship at Bal Bharti Public School, Dwarka and she has come out with flying colours by securing the third position in ‘Below 45 kg’ category. Kunal Chhabra has won accolades in his dream to make it big in Roller Skating Hockey. He has proved his mettle at the Roller Skating Hockey Championship held at Jodhpur and by securing a place for himself at the National Level,Delhi State. The match which will be played at Belgaum,Karnataka,on 8 December 2017.